Parts of southern Chile remained on red alert and schools in some areas of neighboring Argentina were closed Monday after a volcanic eruption coated the countryside with ashes, authorities said. "I ask all the population (in designated areas) to evacuate as soon as possible, because ... human life could be at risk," said Juan Andres Varas, regional governor of Los Rios, Chile. In a statement posted on the Los Rios government's website Monday, he said volcanic material and potentially toxic gases were slowly advancing toward the nearby Nilahue Valley. "Fortunately, the valley doesn't drop abruptly, so we have time to evacuate," he said. Schools in some cities and rural areas in neighboring Argentina were closed Monday, even as the volcanic activity appeared to have diminished, the state-run Telam news agency said. Eastward wind gusts have left a layer of ashes up to 30 centimeters (12 inches) on an Argentinian highway, Telam reported. Ashes had reached the country's Atlantic coast by early Sunday. By Monday, several centimeters of ashes were beginning to accumulate in areas further north, and authorities told Telam the volcano's impact was difficult to predict. "We still don't know, because it depends on the wind how it will continue. ... The recommendation to the population is that they stay inside," said Eduardo Munos, municipal civil defense director in Junin de los Andes, Argentina. How come that planes kept on flying, let's say, 20 years ago? Were there not volcanoes and ash projections in the athmosphere? it is natural no one can think about it beacuse in every menit become chages in globle now but we have to think . who bringing chinges in this world? but we shuld think every thing has woner. who is that woner ? never no one can see some thing in this world withe out woner . i have to trust on that one who has countrol on this world . I suspect that we will see weather effects from this but have no fear Al Gore will explain it all away. Sad for the people there. Danger now is that pressure changes in ring of fire might triggger quakes as far away as USA and even in the oceans. We need to be watching this one. Why do they call it ash when it is glass and rock? Just saying. 'Technically' in Geology* the def. 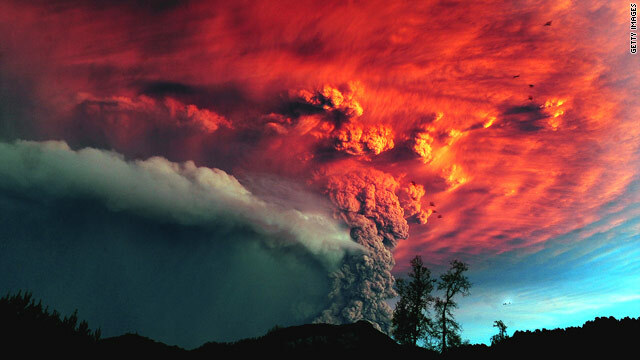 of volcanic ash is: finely pulverized lava thrown out by a volcano in eruption. I suppose the def. depends what kind of 'ash' it is. Did you know the earth has a slight "wobble" kind of like a tire slightly out of balance? Although we are not affected by the "wobble" of the earth today ancient manuscripts tell us that one day this "wobble" will cause apocalytic global disasters that will make this volcanic eruption look mild, http://www.jamesbouvier.com. And changes in the distribution of mass on the earth's surface can affect this wobble. While a major volcano could have some effect, mankind can also alter the 'wobble' of the planet's axis of rotation. Some projects I've seen mentioned as being large enough to have a significant effect are the Three Gorges Dam, Russia's reversal of the flow of rivers that used to empty into the Black Sea, and Canada's current project to dam a series of rivers that lead into Hudson Bay for electricity. Hey whats that flying around over there in the bottom right, when the volcano's in iceland were going off alot of the airports in europe were shut down?! Hi there I found your site by mistake when i schreaed Yahoo for this issue, I need to tell you your website is truly very helpful I also like the style, it is cool!